The Tessitore Suite on the second floor can accommodate up to 3 guests and features a Queen Size four post bed with custom linens, high thread count sheets, writing desk, flat screen TV/DVD, ceiling fan, original coal burning fire place, guest robes, iron and ironing board, clock radio, high speed wireless internet. 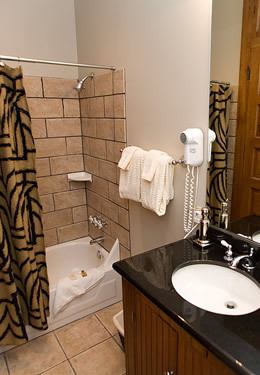 This room features a Private bathroom with granite counter tops, tub/shower combo and hair dryer. 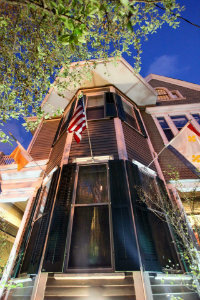 1896 O’Malley House is proud to be the very first bed and breakfast to feature iPads loaded with the new Inn Concierge app. The Tessitore Suite is equipped with an iPad for your use while our guest. The app will give you the latest scoop on the inn and New Orleans.